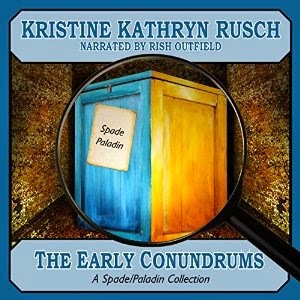 Last summer, Kristine Rusch put out a collection of her "Spade/Paladin Conundrum" stories, which I had done the audio versions of. Her agent asked me if I'd like to record the audiobook for the collection as well. Now, I'd been told before (and many more times since then) that novels sell much better than short stories, and that a collection is closer to the former than the latter. So, I was excited at the prospect (especially since I had done 80 to 90% of the work on this already, so in a way, it would be like free money). I'm not sure what, exactly, happened between last summer and February, but I finally got the contract to produce the audio, and within a couple of days, I had the whole thing done. It contains a new introduction by the author (which was oddly enjoyable to record, since it reminds me of the Dunesteef and my own author's notes), and the five extant Spade/Paladin stories, "Stomping Mad," "The Case of the Vanishing Boy," "The Karnikov Card," "Pandora's Box," and "Trick or Treat." I know I pooh-pooh the whole money-making aspect of writing and audiobook work, but it would be pretty grand if this sold a lot of copies, because a) I would find ways to spend the cash, and b) Rusch might feel the push to write (and publish) more of these convention detective stories. And then we can collect those into a second collection, hopefully not titled "The Humdrum Conundrums."